One of the most important things about your wedding day appears front and center on this wedding invitation! "Today I Marry My Best Friend" is printed in the fonts shown in your choice of color. Your wording is printed in your choice of colors and fonts. 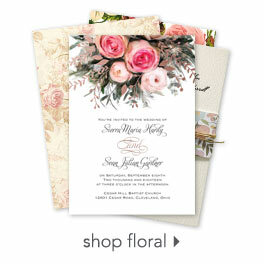 Invitation includes inner and outer envelopes. This product features thermography printing. Thermography is a unique printing technique that results in raised lettering you can feel, which adds to the luxurious experience of this printed piece. We were very pleased with the quality of the invitations. I had to call customer service and they were very helpful. I would definitely recommend your website! These invitations are a great quality for the price. It was a bit confusing entering all the information (we changed the reception card to an accomidation card) but the live help was very responsive and helpful. I had been looking other places for invitations but these guys were the best bang for your buck. They arrived in a timely manner and looked just like I wanted and that showed online. I was extremely happy with my order and especially with your customer service person! !